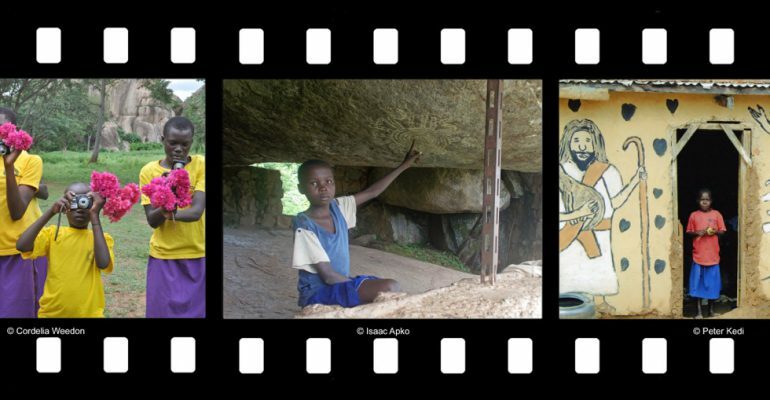 Funded through the Wales Africa Community Links, photographer and educator, Cordelia Weedon, set up this participatory project in partnership with Ugandan colleagues in 2009. It aims to give young Ugandans a voice to frame the world in their own terms. Cordelia has run several different Photo Diaries projects, initially in schools in northeastern Uganda, to initiate links with schools in Wales. More recently the Orphans & Vulnerable Children, living alongside Nyero Rock Painting and Ngora, have participated in this project. These children have never had the opportunity to use cameras before, so workshops were set up in a way to give the young people some basic composition and technical skills; then they took cameras home for several days, and had a lot of fun using them, before editing, then adding their own words and drawings. Documentary photography has the potential to implement change in society and this approach is a way of seeing life in Uganda through the eyes of children from their perspective. Engaging young people in an inclusive way helps to build their confidence and contributes towards raising awareness.